The bright yellow, star-shaped flowers of biting stonecrop have appeared along the edge of our drive-way again this June. It’s the second year running and I find it very welcome for, I think the flowers are like rays of sunshine. It intrigues me how plants suddenly appear in places where I’ve never seen them before. I know there are various ways in which seeds can be distributed, by birds, wind, or vehicles to name a few. Last year, the plants grew along both sides of our street (see pictures above) at the edge of a grassed area round the corner and at the edge of a garden down a nearby pathway. I also saw a patch of the plant outside a King’s Lynn factory. This year, it just seems to be down our street, and virtually all of it is on our side of the street since some builders cleared up after doing some work at the house opposite. The biting stonecrop is low growing, mat forming and is a succulent. It is also known as sedum acre and is a member of the Crassulaceae family of plants. Simon Harrap in his wildflower book, describes it as a common plant, found in bare places on dry, thin or virtually non-existent soils, such as shingle, dunes, short turf and rocks and also walls, roofs and other man-made structures. Similarly, some fox-and-cubs plants grew on the verge opposite our house for the first time last year but after the council has carried out regular mowing, there only seems to be one plant this time. The fox-and-cubs, or orange hawkweed, is another plant I find very cheerful. Wild plants are very tenacious. For instance, they fix themselves in gaps between paving stones, in walls, on the tops of walls, along the edges of roads, anywhere they can get a hold. You have to admire them! It reminds me that the wild world is still out there, very close to us, even in an urban setting, and I think it is better than everything looking sanitised. These “weeds” help to bind the soil together and to give it nutrients. Poppies waving in the breeze on the Church wall. 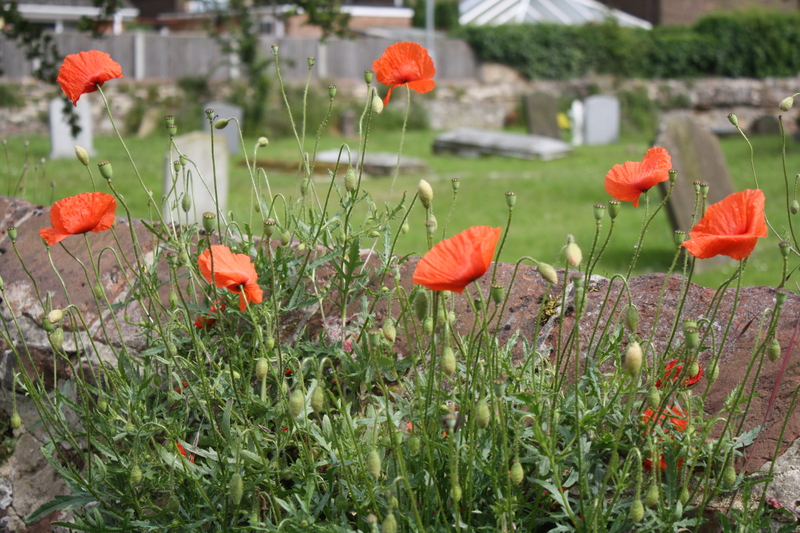 At the week-end, I found a beautiful display of red poppies growing in the wall surrounding South Wootton Church. In the same wall were several patches of ivy-leaved toadflax, whose flowers remind me of violets and which is a common plant to find growing in such situations. There also is a moss, I think. I also spotted ivy-leaved toadflax growing in the wall around the railway station car park in King’s Lynn. Another plant growing in the wall. And now, on to a weather report! Today began with sunshine, but by late morning, we had drizzle and then more definite rain. By the evening, that had cleared. Well, last year on June 22nd, in the middle of the afternoon, ,we had a hail storm! 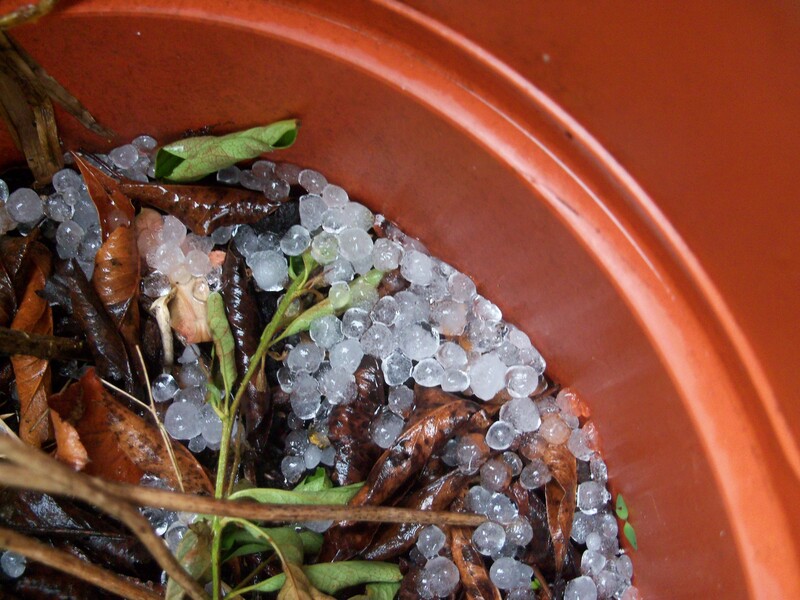 And I managed, for the first time, to get some photos of the hail stones lying around in the garden. They took a little while to melt; I had thought they would disappear as soon as they landed! Anyway, I’ve been waiting for an opportunity to use one of the photos I took! Little shiny balls of hail.